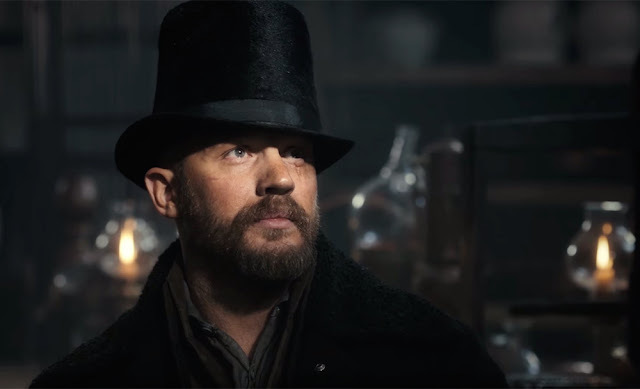 No Blogging for Old Men: The Small Screen: Taboo Episode 1 "Shovels and Keys"
The Small Screen: Taboo Episode 1 "Shovels and Keys"
Tonight on FX, the brand new miniseries Taboo from creators Chips Hardy, Steven Knight and Tom Hardy (who also stars) debuted. The series follows James Keziah Delaney (Hardy), a man who has returned to London in 1814 after being away and presumed dead for 10 years. The reason for his return is the death of his father and his desire for vengeance, and upon his return he learns he has inherited the family shipping empire. - The show will certainly not work for some on a tonal level, being that it is a dark and rather morose episode, but it is absolutely right up my alley. - Are you a fan of Tom Hardy? If so, you will love him here. 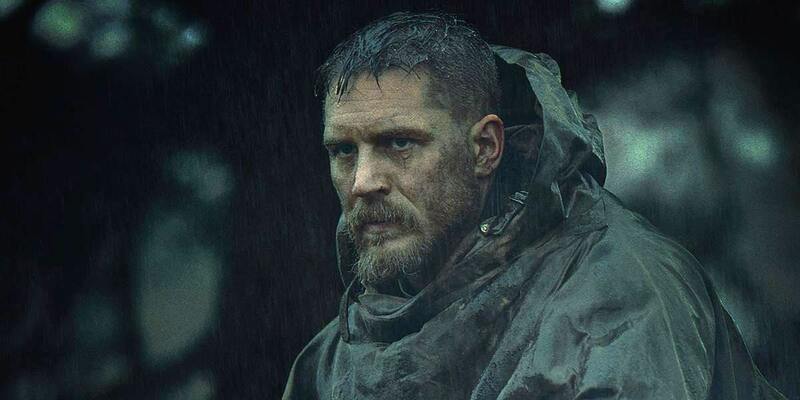 His character feels like a blend of others he has played before, an imposing figure like Bane in The Dark Knight Rises, fitting into an 1800's setting like his Oscar nominated performance in The Revenant, and a bit of the wonderful crazy that shined in Nicolas Winding Refn's Bronson. - While not an action packed nor a typically "exciting" start, this first episode is well written and excellently performed, and typically a premiere is meant to set the table for the rest of the season. - I absolutely love the dark, shadowy aesthetic of the show, and it is beautifully photographed by Mark Patten. The preview of what's to come during the rest of the season showcases that this will not change, with so many gorgeous shots. - The second billed star of the show is actress Oona Chaplin, granddaughter of the iconic and incredible silent film star Charlie Chaplin. Just a fun nugget. - While I am a huge fan of binge watching a series of Netflix with their dumping all episodes of a season at once release format, I will say there is something fun about the traditional weekly installments. The tease of wanting to see what will happen next but having to wait a week, having something to look forward to and knowing that a new show will take 8 or more weeks to get through rather than being a lazy Sunday away from being completely done with it reminds me of being a kid and I would count down the days until the next new X-Files episode. Count me in for the limited run of Taboo. It wasn't a perfect premiere and I am not sure this specific episode will prove to be very memorable, but I can't shake the notion that we will see something special going forward.